No, This is not a late Halloween post. This is actually right on time! Because this is a Day of the Dead (or Dia de los Muertos) themed project. 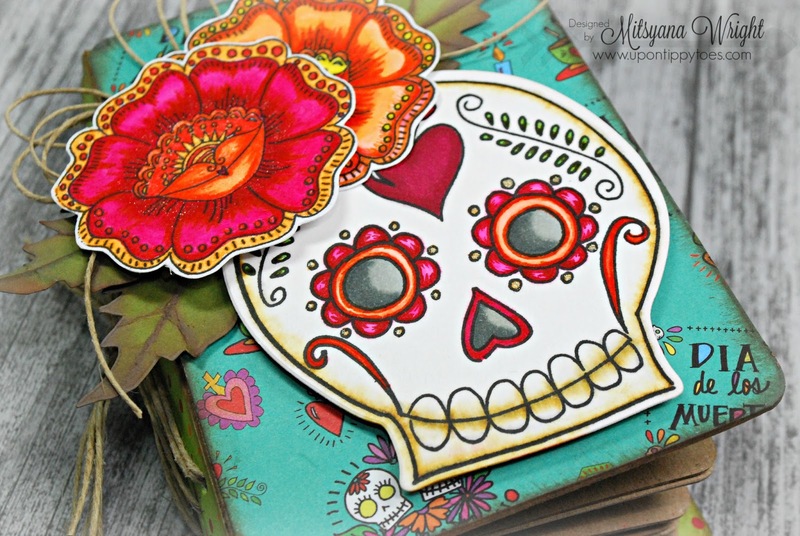 Day of the Dead is a Mexican Holiday that celebrates family, love, and remembrance of those who passed. And ironically is not just a "day" but three days long. Each day is reserved for the remembrance of a child lost (Oct. 31) or an adult (Nov. 1) and for visiting of the souls at the graves of the departed loved ones (Nov. 2). Graves are cleaned and decorated. These shrines are often adorned with marigolds and sugar skulls and the favorite food or drink of the deceased. You can read more about this amazing holiday here. I have come to love this wonderful holiday. 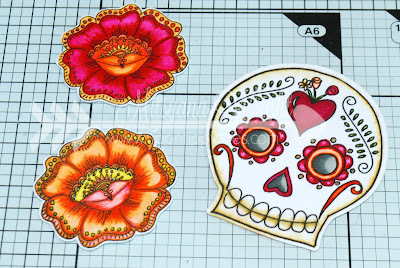 I am drawn to the traditions, bright colors, flowers, and of course, sugar skulls. And though I am not of Mexican descent, I still have a huge respect for the culture. What's there not to love?? 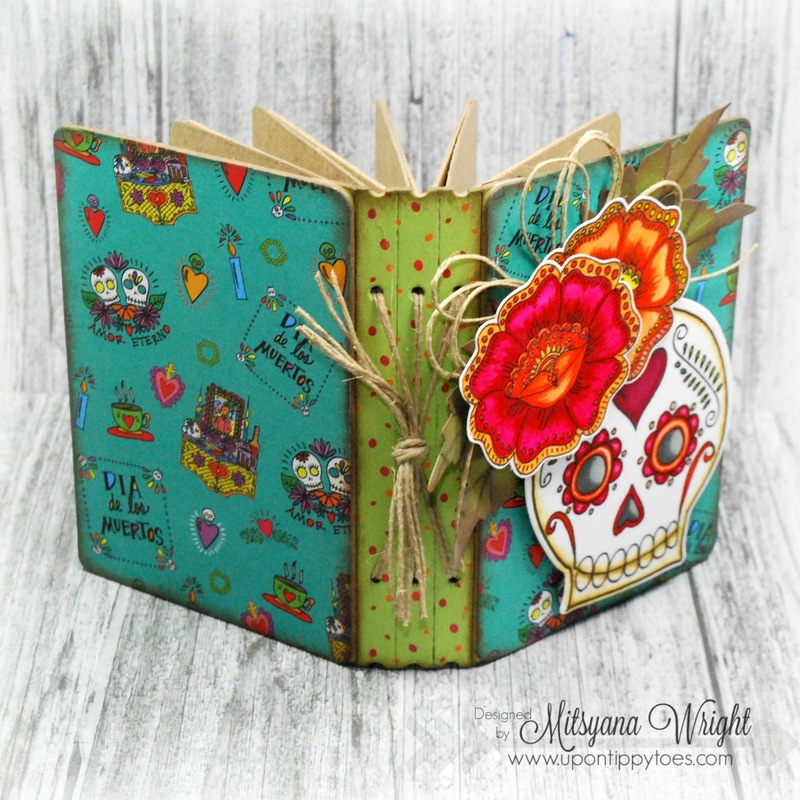 So I made this Dia de los Muertos inspired Art Journal to show my love for this amazing and beautiful holiday! 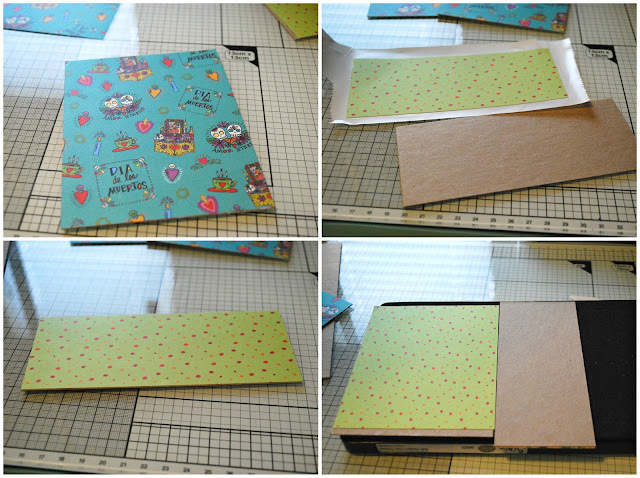 I start by cutting two pieces of chipboard down to 4.25" x 5.5" pieces. 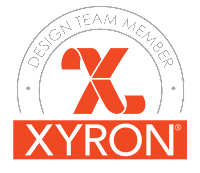 Then, I run both pieces through my Xyron Creative Station Lite machine and add adhesive onto both sides of each of the chipboard pieces. 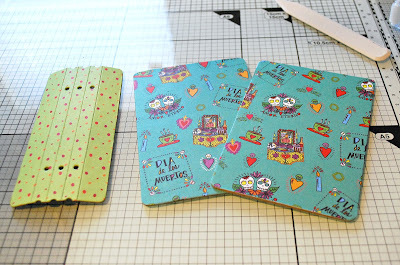 I also cut my patterned paper, from Crafty Chica's My Happy Life Cardstock Pad to 4.25" x 5.5" pieces. I peeled the protective film off and adhere a sheet of cardstock onto both sides of each cardboard piece. I also repeated those same steps onto a 3" x 6" piece of chipboard. But only applied paper to one side of the chipboard piece. Then, I laid both pieces onto my Eileen Hull Passport Die and cranked it through my Big Shot machine. Tip: Make sure to put whichever paper /side you want on the outside of your cover to be faced down against the blade. Here I have the basic parts of the book all cut out. 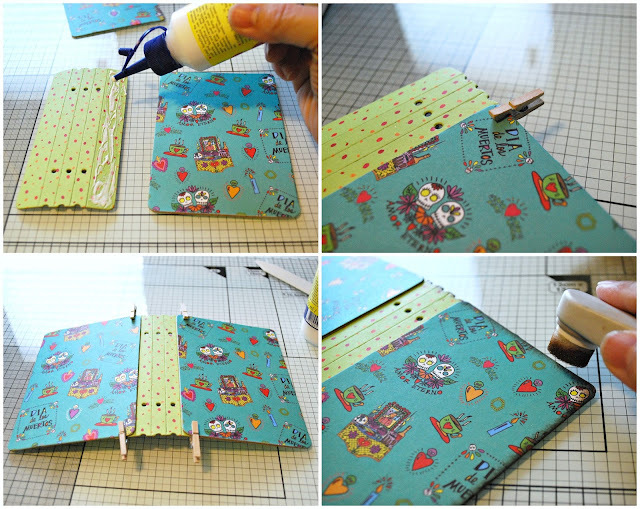 I add tacky white glue down the spine and adhere the front and back covers together. To ensure and good grip and proper alignment I like to use mini clothespins to hold my pieces in place. Then, once the glue set I inked the edges of the entire book with an Eille Hull Blends applicator in Nutmeg. onto mixed media paper using VersaFine Onyx Black ink. Then, colored them in using my Zig Clean Color Real Markers. 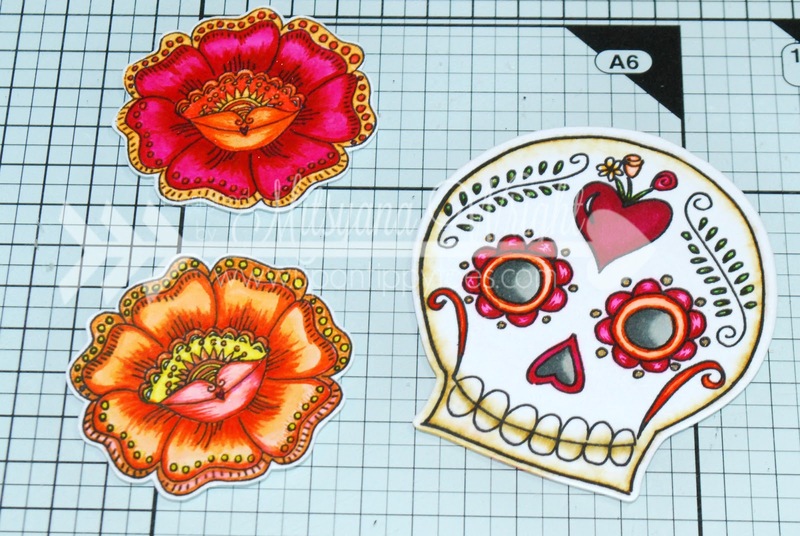 Once I was pleased with my coloring, I die cut the images using the matching dies that came in each set. 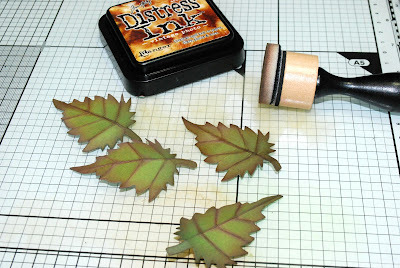 I die cut a few leaves out of green cardstock using Eileen Hull's Leaves, Spring die. I folded down the center to create a spine. 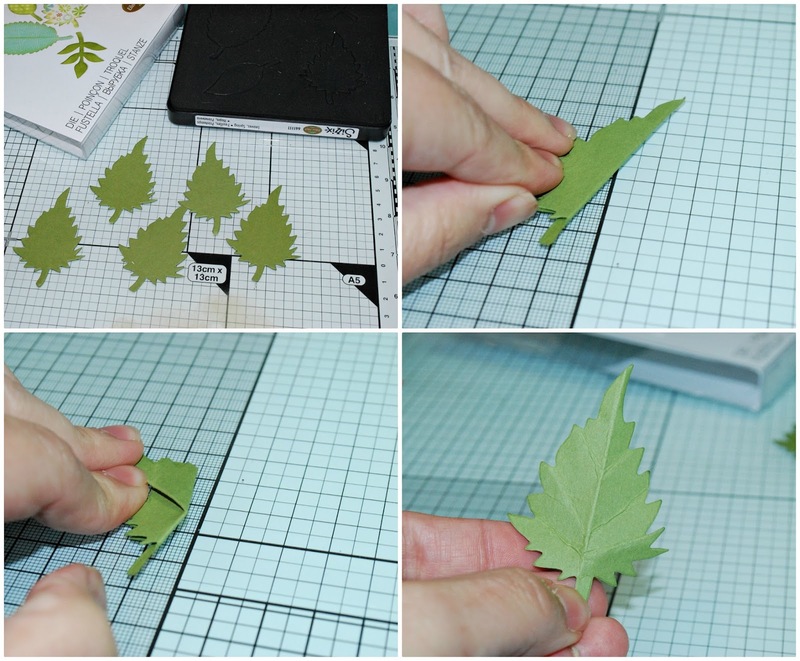 Then folded at a diagonal to create the veins in the leaf. I inked over the raised creases with distress ink and a blending tool. 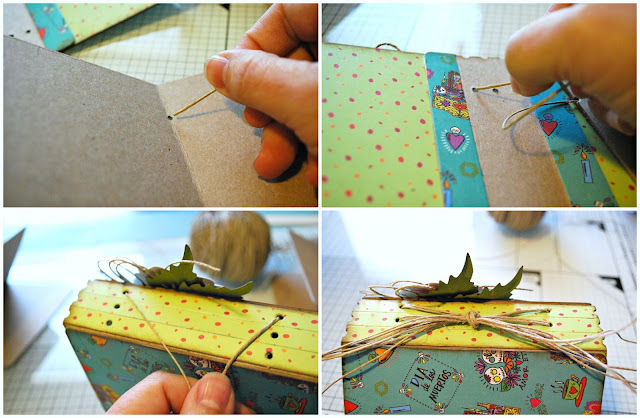 Then attached the leaves, twine bow, and sugar skull onto the front cover of my book. Then I attached the flowers over those. I added foam dots under the skull and one of the flowers for a bit of dimension. Now that the cover is done, I moved onto the inside. I die cut the insert pages from the Eileen Hull Passport Die out of plain chipboard. 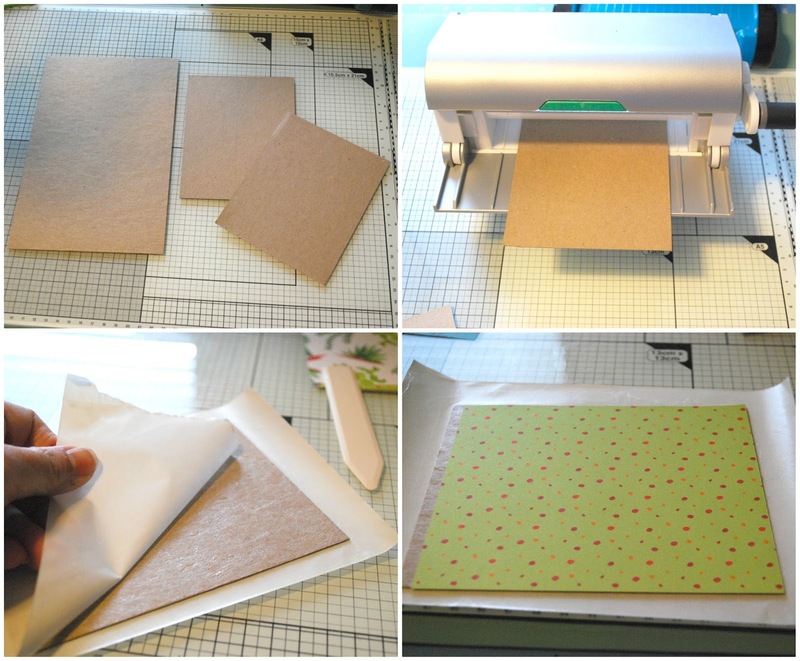 Then simply folded and creased each chipboard page. I fastened each page to the spine using hemp twine. I inserted each individual strand through the hole in the page, then, through the hole in the book. I gathered the strand on the outside of the spine and tied at a basic knot. I left all the pages blank because I plan on using this as a mini art journal. Chipboard is great at holding its shape against moisture. All I need to do is slap coat of gesso onto the page if I plan to paint. The gesso helps to prevent the paint from getting sucked up by the chipboard and makes your paint spread further. Happy Day of the Dead Everyone!! Beautiful cover on your art journal, and I really like the unique binding! Your cover is beautiful, love the colors you used. Very nice! 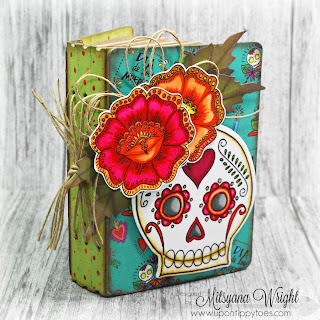 I like your unique book binding!